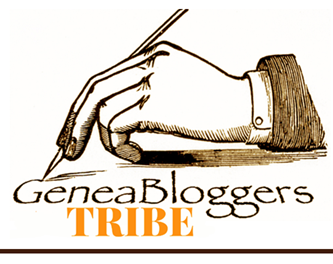 Lisa Alzo of The Accidental Genealogist blog presents Fearless Females: 31 Blogging Prompts to Celebrate Women’s History Month. 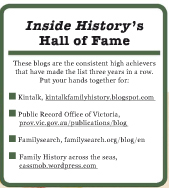 The final challenge for the month is to write a 500 word mini-profile of a female ancestor. I’ve chosen one of my lines that I don’t write about often, and a female ancestor who rarely appears in my blog spotlight. Bridget Furlong was born to Martin Furlong and his wife, Margaret nee Sta(u)nton and baptised on 29 December 1840 at the Roman Catholic Church, Tullamore, Kings County (Offaly). The Griffith Valuations place the family in the townland of Shr(u)agh, but their absence from the church records suggests they were not native to Tullamore. Nothing is known of Bridget’s early life other than that she lived through the devastating experience of Ireland’s Great Famine. Later generations of Furlong men would be skilled Gaelic footballers. Were Bridget’s brothers, John and Martin, similarly talented? Bridget married James Sharry, a railway man, in Tullamore on 21 May 1859 (witnesses John Horan and Maria Slavin). Their sons, Peter (1861) and James (1865) were both baptised in Tullamore but their second son, Martin, was baptised in 1863 at Arklow, Wicklow. 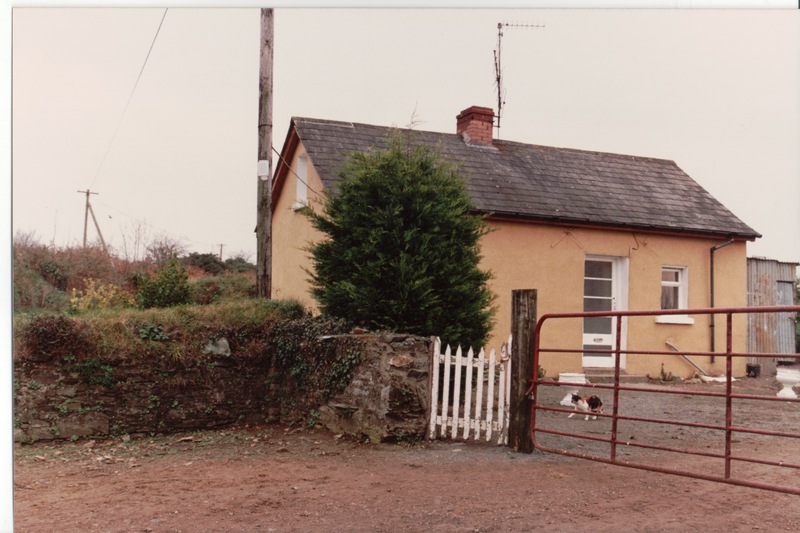 Their childrens’ baptisms track the family’s movement from Tullamore to Arklow to Gorey, Co Wexford where the family settled in the townland of Knockina, probably in a railway house. Around the time of their 23rd anniversary the couple made the decision to emigrate. Queensland was building its extensive railway network and James would have readily gained employment as an experienced railwayman. 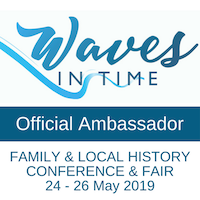 James and Bridget and eight of their ten known children (James, John, Mary Agatha, Margaret, Bridget Agnes, Catherine, Esther Anne, and Patrick) arrived in Rockhampton on board the Melpomene on 20 January 1883. The family name changed to McSharry, possibly to piggyback on the renowned railway company, McSharry and O’Rourke. Son Martin may have died in Ireland[i]. Eldest son Peter, wife Mary, and his young family would arrive in Australia a year later, changing his name to McSherry. The McSharrys settled first in Rockhampton where James worked as a railway platelayer[ii]. As with the Irish records, BDM events track their geographic movement. Daughter Margaret died in Rockhampton in 1884, aged 12, of shock from burns. John, aged 19, drowned in the flooded Claude River in March 1887 while working as a labourer on/near Mantuan Downs station. Their youngest son, Patrick, died in Gympie in 1889 of pericarditis, aged 8 years. Newspaper reports seem strangely silent on the deaths except John’s. James McSharry is not listed as the informant on the certificates. Bridget reappears running boarding houses, first in Maryborough (1892-93) and then in Derby St, Rockhampton (1894-97). James disappears entirely from view and nothing has been found of his death. Did James desert her as I suspect, or has his death gone unreported somehow? Certainly life went badly wrong for her and the family not very long after their arrival. Down all these years I feel the terrible sorrow of her loneliness and the betrayal of her dreams, but no loss of faith. Bridget McSharry née Furlong, a widow aged 59, died in Rockhampton on 13 July 1900 and is buried in the North Rockhampton cemetery. Tullamore Parish register – information received from Offaly Historical Society. Confirmed through LDS microfilm 926186. Griffith Valuations on microfiche (Tullamore). Gorey parish records viewed on site. [i] Bridget’s death certificate lists three sons and one daughter deceased: John, Patrick, probably Martin and Margaret. [ii] Queensland Death Certificate for daughter Margaret McSharry. My “Most Wanted” family member: who was James Sherry? From clker.com in public domain. 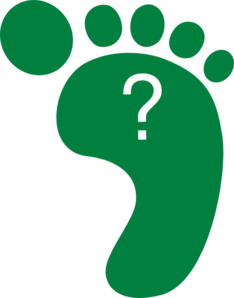 Intended as a question about going green, it also represents my questions about where James Sherry came from, where he went. Geniaus raised the Saturday challenged initiated by Thomas McEntee On his Destination Austin Family Blog, which in turn revived Craig Manson of GeneaBlogie‘s meme from 2009. For today I’m going to focus on my “most wanted” family member and leave the surnames to Surname Saturday. Ever since I started family history all those years ago, one ancestor has provided me with an “impenetrable” brick wall. James Sherry is first identified in the “public” record in Tullamore, County Offaly (Kings County as it was then). On 21 May 1859 he married Bridget Furlong, a local girl from the townland of Shruagh, in the old Catholic Church, with witnesses John Horan and Maria Slavin.Their first two surviving sons, Peter and James Joseph, were also christened there, on the same date 29 May, in 1861 and 1865. Peter, is my direct ancestor. Their second-born son, Martin Sherry (named for Bridget’s father) was baptised in Arklow, Wicklow on 15 July 1863 with witnesses James and Margaret Halpin. Martin did not emigrate with the family and nothing is known about whether he died or remained in Ireland. A typical Irish cottage at Knockina, complete with cat. During their years in Arklow, James was working as a ganger on the railway, presumably on the Dublin, Wicklow and Wexford line. Several children were born and baptised in Arklow before the family moved to Gorey, Wexford where they settled for about 10 years. At the baptism of each child born in Gorey, the family states their townland as Knockina, just outside Gorey township. Having researched the Griffith Valuation revision lists for the period, it seems that the Sherry family must have been living in a caretaker’s cottage owned by the railway as all other properties are accounted for. This would suggest that James had reached some level of responsibility with the railway. 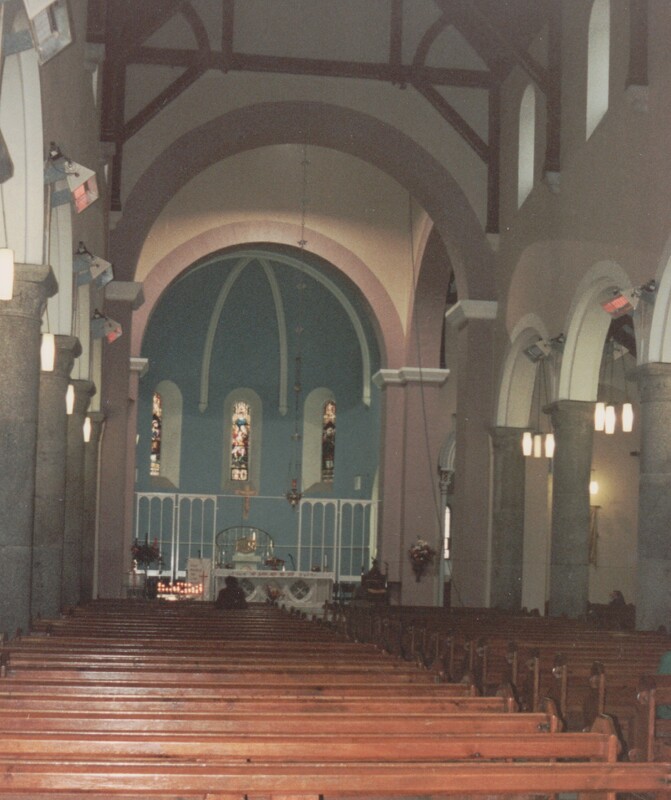 The interior of St Michael's Church, Gorey, Wexford 1992. Site of Sherry baptisms and Peter's marriage. So far, so good, you’re wondering why I have a problem….after all I have quite a bit of information on them, thanks to the baptism of all those children. But there’s one thing missing – where did James come from and what’s his ancestry? Name distributions suggest he probably came from one of Ireland’s northern counties, possibly Monaghan, Fermanagh, or Meath. Dublin is also a strong contender but surely if he was from there one of his family would be a witness to at least one of the baptisms. In 1882 James and Bridget Sherry emigrated to Queensland with all their children, except eldest son Peter. On arrival in January 1883, the family changed their name to McSharry, supposedly with the idea that he would ride on the coat tails of another James McSharry, the partner in O’Rourke & McSharry, railway construction contractors. If this was his goal, he certainly succeeded from one point of view. From that time forward my James McSharry cannot be readily identified. Despite the family’s horrendous luck with three children dying within a few years of arrival, James does not appear as the informant on any of the death certificates. By 1892, Bridget McSharry was listed in the post office directories as a boarding house keeper in Maryborough and later in Rockhampton, where she died in 1900. Had James died so that she needed to take up this work? No problems, surely his death certificate can be found, and this will most likely tell us his place of origin and his parents’ names? Good theory, nil outcome. Despite searching around the country, this James McSharry/Sherry appears to have disappeared off the face of Australia at least. I’ve looked for him in Police Gazettes thinking he might appear there – if he had “done a runner” and left his wife with the children, they might have chased him for maintenance. Of itself this seems strange given they’d been married over 20 years and just made the tremendous decision to emigrate, but perhaps he hadn’t coped with the death of his children. I’ve searched cemeteries, inquest indexes and hospital admissions all to no avail. Trove throws up innumerable references to the construction company and even occasional documents found at the Archives remain ambiguous. One clue appears when his daughter marries in Rockhampton in 1903, said to be the daughter of James McSharry, late of Sydney. Does that mean “recently of Sydney” or deceased…but I suspect it meant the latter. My suspicion is that it is a red herring to infer he may be the partner in McSharry & O’Rourke who was by then in Sydney. Searches of NSW death certificates were not forthcoming. To confuse matters further this James’s eldest son, Peter, arriving in Queensland in early 1884 with his family, changed his name to McSherry and also joined the railway immediately. 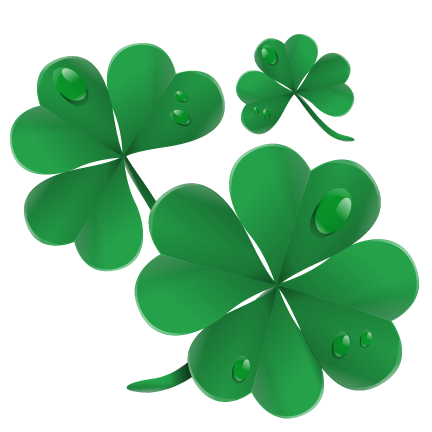 To this day, many of the leaves on this family’s branches do not know of the interconnection between the McSherry and McSharry families or indeed within some branches of either. Did James emigrate to New Zealand or elsewhere to work on the railways? Did he return to Ireland? Did he die but never make it into the records? Was he admitted to a mental asylum somewhere? Was there some sort of scandal? Questions, questions! My bet is that his father’s name was Peter Sherry and that he was probably born somewhere in Ireland’s northern counties. Searches at RootsIreland have been unproductive or inconclusive. Without some proof, or some clue about what happened to James, or where he went from Australia, this line is stone-walled.